NFRMPO residents ride bicycles and walk to destinations in northern Colorado every day. The Federal Highway Administration (FHWA) and the NFRMPO recognize these non-motorized modes as a critical tool in moving people, reducing emissions, and improving resident’s quality of life. The 2016 Non-Motorized Plan informs bicycle and pedestrian planning in the region. The Plan expands upon the Regional Bicycle Plan developed in 2013. Non-motorized planning is also incorporated into the 2040 Regional Transportation Plan (RTP), adopted in September 2015, which provides the long range transportation vision for all modes. The Northern Colorado (NoCo) Bicycle and Pedestrian Collaborative provides a monthly meeting place for people and organizations to discuss non-motorized transportation topics in northern Colorado. Additionally, the Collaborative held the first Northern Colorado Bike and Walk Conference in 2015 to facilitate the growing non-motorized transportation dialogue in the region. Position the NFRMPO communities to pursue state and federal funding opportunities. 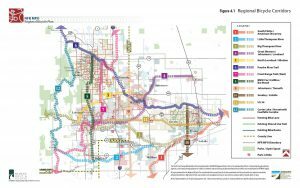 The NMP updates the 2013 Regional Bicycle Plan and introduces a pedestrian component, includes survey results on non-motorized transportation, provides resources and tools for non-motorized planning, and includes a map of all non-motorized facilities in the NFRMPO region. In 2013, the NFRMPO created the Regional Bicycle Plan to evaluate existing infrastructure and recommend future improvements to the regional bicycle system. Information from the plan was incorporated in the 2040 RTP, adopted in September 2015, to provide the long-range vision for the NFRMPO. 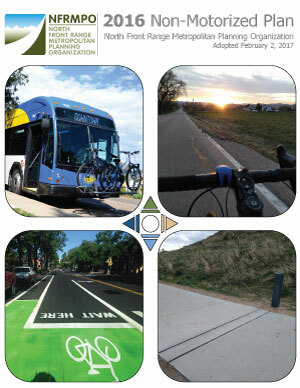 The corridor based plan explored bicycle performance monitoring, infrastructure expansion, design standards, and future connections between the NFRMPO’s member governments, trail systems, employment centers, and recreational opportunities. The NFRMPO maintains a list of bicycle and pedestrian resources regarding plans, projects, and other informational items. You may direct non-motorized related questions or comments to Ryan Dusil at rdusil@nfrmpo.org or (970) 224-6191.